A quick hitting low pressure system will bring rain and snow to Wednesday night ending Thursday morning. Rain may begin as early as Wednesday afternoon with the main event arriving sometime around midnight. Radar loop simulation for Wednesday night into Thursday morning. The thunderstorm activity may be overdone due to this model strengthening the low too quickly, but a few storms are certainly possible. Rain for most with the heaviest rainfall amounts of 0.5-1.0" from central into northeast Wisconsin. Thunderstorms containing small hail are possible. Severe weather is not expected. Locally higher rainfall amounts where/if t-storms occur. The hail is due to cold air aloft this time of year. 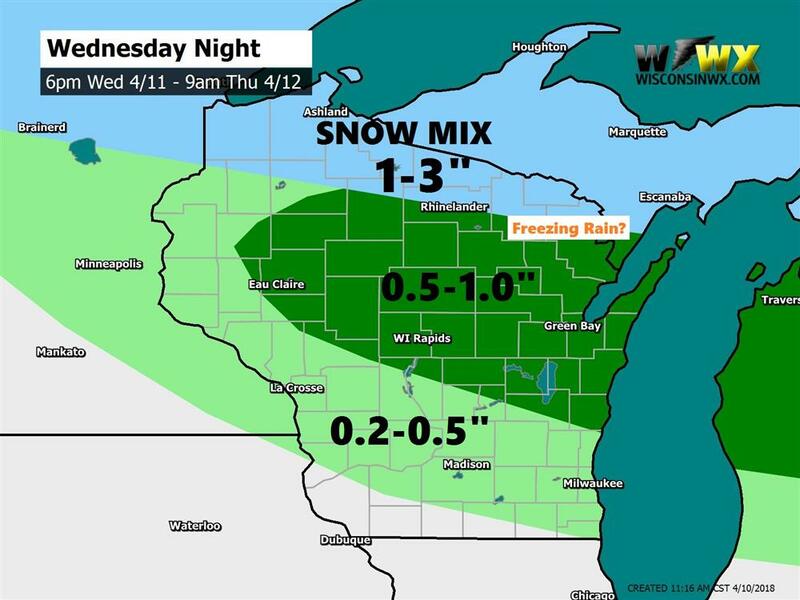 1-3" snow along the WI/UP MI border and in far northern/northeast Wisconsin. Locally higher amounts are possible in upper Michigan. The snow may mix with or change to rain. Small chance of freezing rain in northeast Wisconsin. In southern Wisconsin, increasing wind gusts to 20-30 MPH Wednesday night, then briefly up to 40 MPH before weakening quickly Thursday morning. The weekend does not look good. We are tracking a major storm system arriving Friday that has the potential to bring snow, heavy rain, and thunderstorms to Wisconsin! Plenty of uncertainty remains so stay tuned to future forecasts!